The Goboist: ART THROUGH THE WINDOW OF A MOVING TOUR BUS!? Alright, I know this is not the modus operandi of your basic National Geographic photographer, but when we’re going through some third-world countries I don’t even want the bus to stop—much less get out ( “Never get out of the boat!” ) and walk around wearing a bunch of expensive camera gear! Admittedly these images are not my photographic destinations (where we do get off the bus! ); these images are just happenstance on the way to our destination. Even though my yield is low doing these moving targets of opportunity—so is the risk! Sometimes I capture something special that I can call art…. Someone’s faded dream in a small Mexican town. This image demanded to be in Black & White so I compiled. Get in the bus early to get a window seat. Open the window, if possible, if not clean it. The image above was captured through the glass and I had to edit out some class glare. Use a shutter speed of 1/500 sec. or higher; don’t hesitate to up your ISO; I’m usually at 400 or 800 ISO. Get a seat on the same side of the bus for the trip back (they usually return the same route) so you can photograph something different. And, really important, look ahead and be ready (I keep my camera just below eye level); when the bus is doing 30 mph you’ll only get one or two images off as your subject flashes by. 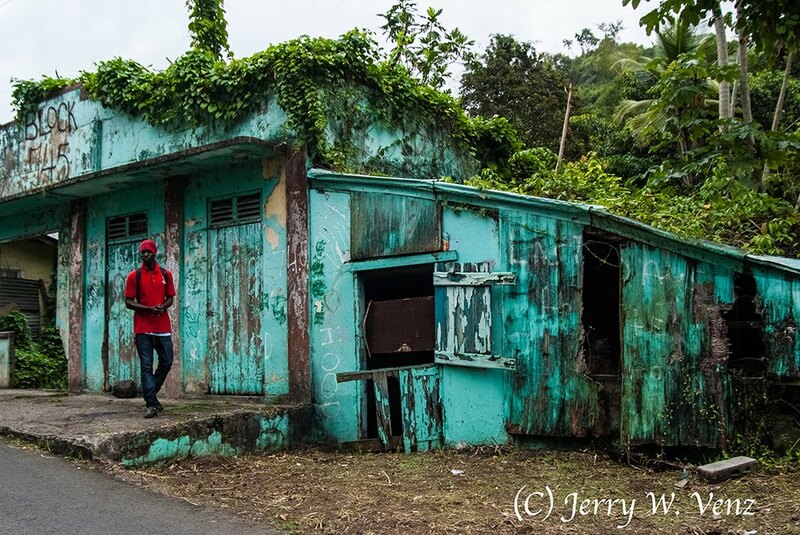 Some of the poorest towns we’ve visited have been in the Caribbean…. Passing through the run down little towns on Grenada was sobering yet colorful. This one was also captured through the glass on an overcast day—so there was no glare. 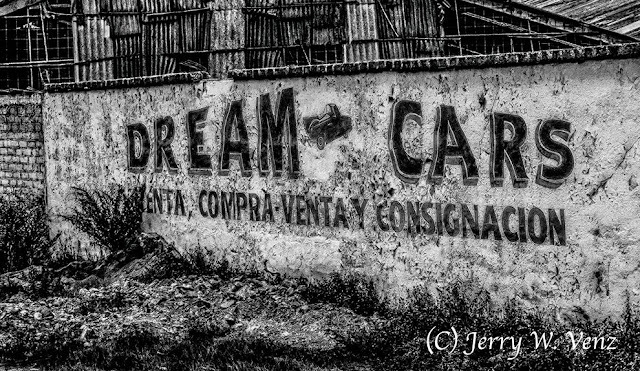 Then on our way back through town our bus was slowed way down in traffic so I was able to get several images of this little store…. With so little color in the scene this too was a natural for black & white. Of course, the men seen through the store’s open window was my focus. That is the man at the window still was my focus; I didn’t know that man to the right—sitting in deep shadow—was even there until I cropped-in on the original image. 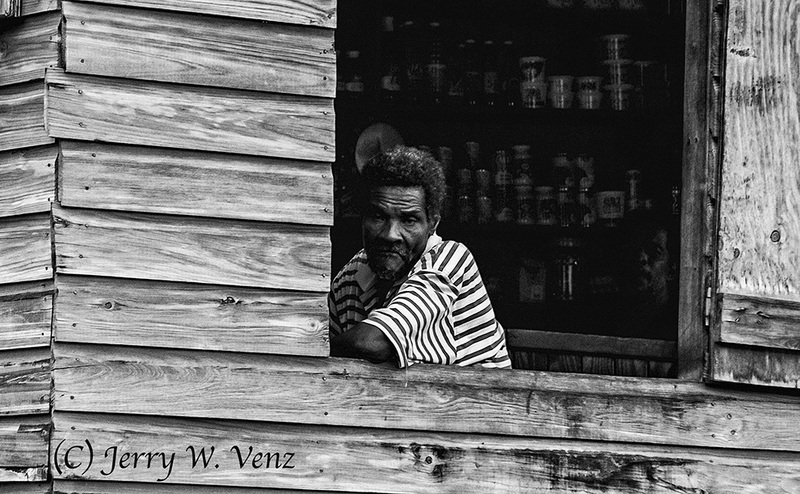 I’m still struck by the stare on the man’s face as he leans on the window sill. It’s much like the “thousand yard stare” that happens to soldiers in battle. He looks beat-down by his environment, hopeless, resigned to his fate. Then there’s my guilt when I look at him, because he gave me something here and I gave him nothing. He gave me new appreciation for all that I have and where I just happened to be born. I guess this unfair exchange is the occupational hazard of most street photographers.